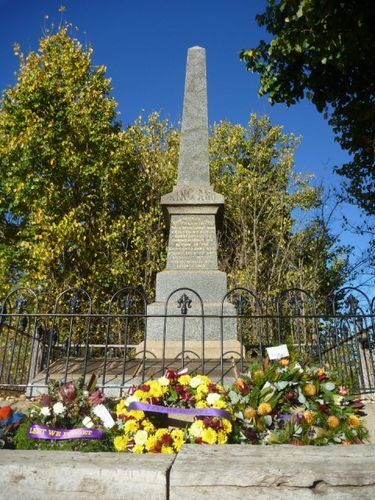 Gundaroo War Memorial commemorates those who have served in conflicts in which Australia has been involved. The memorial was originally erected in memory of those who served in World War One. This memorial was fully restored by the people of Gundaroo, in time for ANZAC Day 1980. The sports in aid of the Soldiers' Memorial passed off pleasantly on Saturday afternoon, but the attendance was only fair. Well to do landowners in the district, with a few exceptions, took little interest in the memorial, and contributed no more than the average working man. When the Germans had almost reached the gates of Paris, and fear had stricken the hearts of most men, and flag flapping was a fine art among the ultra loyal, our boys were noble heroes comparable only to the ancient Spartans. Now their brave deeds are passing memories, and not considered worthy by some people of a few paltry shillings to erect a tribute to the memory of the living or the fallen. A sum of about £20 was cleared by the combined result of the sports and a dance till midnight on Saturday. The memorial was publicly unveiled on Saturday afternoon before a large gathering. Mr. J. E. Ireland, J.P., occupied the chair. He thanked the people who had assisted the movement, and paid a striking tribute to the fallen soldiers. Mr. T. F. Heazlett was then called upon to perform the unveiling ceremony. On These Plaques Are The Names Of Those Born Or Resident In Gundaroo And District Who Served Their Country In Time Of War.